So begins a section in the book "Wind Energy in America: A History" by Robert Righter. The quote from Herbert of Bury (Suffolk, Great Britain, circa 1180), aptly describes one of Righter's central themes: that there has always been a "friction between centralism and localism" in the use of energy. In this case Herbert was trying to use the power in the wind to liberate him from feudal despotism. Wind energy, says Righter, has always lent "itself to individualism and decentralization" and as such has often been seen as a tool of emancipation by the downtrodden. Herbert lost his battle with the tyrannical Abbot Samson, who ordered Herbert's windmill destroyed. This unfortunate outcome illustrates that the use of wind and other forms of renewable energy is far from assured and certainly not inevitable. For even today the progress made in California and elsewhere across the country is threatened as the U.S. Congress--in just one session--seeks to eliminate all funding for renewables' research and development, cancel renewables' production tax credit, and repeal the Public Utility Regulatory Policies Act (PURPA). The latter permits Americans of any class, color, or creed to install their own wind turbines much like Herbert of Bury had attempted to do. It's as if Abbot Samson has risen from the grave, slipped out of his clerical garb and, newly wrapped in a free-market shroud, stalks the halls of Congress to smite as many windmills as he can before the sun rises again. The struggle between democratic and centralized control of energy continues. Righter examines this and other weighty subjects in the first book length treatment of the development of wind energy in the United States by a professional historian. As a professor at the University of Texas at El Paso, Righter specializes in the history of the western United States. He is best known among historians and environmentalists for his insightful book, "Crucible for Conservation," which describes the fifty-year effort to create Grand Teton National Park. He is the first writer from outside the field of wind energy to bring his talents to bear on this subject since Volta Torrey, a NASA science writer, published "Wind Catchers" in 1976, and T. Lindsay Baker wrote "A Field Guide to American Windmills" in 1985. As a historian, Righter treads on treacherous academic turf because his book covers the tumultuous 1980s "wind rush" in California and includes interviews with many participants who are still living. Traditionally, historians confine themselves to long-forgotten events or to pubic figures that are safely interred. He himself asks rhetorically, "When does history end and current events begin?" To many in the field of wind energy, says Righter, "nothing happened before 1980." He notes that "Of course, something did happen, but it was prelude" and to stop his narrative short of the dramatic growth of wind energy in the 1980s was "tantamount to playing the prelude without the opera." Righter's chapter "California Takes the Lead" is the best account yet of the heady days in the early 1980s when idealists, entrepreneurs, and not a few scoundrels flocked to California's windy passes to find their fortunes. He offers a behind the scenes look at the California Energy Commission, Governor Jerry Brown's Office of Appropriate Technology, and the political process that resulted in what is still the world's largest concentration of wind turbines. Righter also explores the controversy surrounding former mayor and onetime rock star Sonny Bono (of Sonny & Cher fame) and his attempt to remove wind turbines near Palm Springs. Using his investigative skills as a professional historian, Righter has unearthed some original and intriguing material relating to the role--and the promise--of wind energy in the United States. He opens his chapter on Charles Brush's massive "wind dynamo" and the general American fascination with the potential of wind energy in the late 19th century with a prophetic quote from William Thompson (Lord Kelvin) "[It is not] utterly chimerical to think of wind superseding coal in some places for a very important part of its present duty--that of giving light." Righter's book offers several historical anecdotes that will interest wind energy professionals and novices alike. One is a description of Samuel Peppard's 350-pound "prairie schooner," which Peppard "sailed" 500 miles across Kansas and Colorado before it was hurled into the sky by a whirlwind. Another is Dew Oliver's 1920's "blunderbuss" wind turbine in the San Gorgonio Pass. Though the book concentrates on wind-generation of electricity, Righter also discusses the important role of the water-pumping windmill in American culture. He recounts historian Walter Prescott Webb's oft-cited observation that widespread settlement of the American Great Plains was impossible before the advent of the Colt 45 revolver, barbed wire, and the inexpensive, mass-produced farm windmill. Righter's research into a wealth of archival materials paints an engaging picture of early American experiments adapting the water-pumping windmill to generating electricity. Righter's interest in wind energy began innocently enough with a visit to a ranch in Nebraska where he noticed a steel tower standing "rather forlornly." Righter assumed that the tower had once supported a traditional American water-pumping windmill like the thousands of others in the state. But the rancher quickly set him straight by explaining that the tower "once held a wind turbine and that for some years it had supplied his family--himself, his wife, and children--with electricity." Righter learned that even as late as the 1980s the rancher still doubted he had made the right decision when he switched his electricity from the windcharger to the Rural Electrification Administrations' "highline." The reason for the rancher's doubt was quickly apparent. "Across the rolling hills from his ranch stood two tall smokestacks," Righter says, "emitting residues from a coal-fired generating plant." This exposure to an abandoned 1930s-era windcharger and a rancher's disenchantment with a rural electric cooperative that burned coal literally outside the rancher's back door led Righter on a Don Quixote-like quest to learn more about this period. The journey led to "Wind Energy in America." The spasmodic development of wind energy in the United States tempts Righter to "place blame for failure and give praise for success." The Department of Energy's big turbine program "is particularly vulnerable," he says, "since approximately one-half billion dollars have been spent in the effort between the years 1974 and 1992." But "like any boom, the wind-energy business--in both public and private sectors--was replete with the interplay of good intentions and flawed public policies. . . Whatever the mistakes of the past, the first phase of the wind energy story is at an end." On energy policy in general, says Righter, Americans unquestioningly embrace a "myth of superabundance. There is the feeling that the nation drinks from a never-ending fountain of energy. . . Thus, the visionary ideas of engineers such as Palmer Putnam (and Percy Thomas) were blithely cast out by politicians and scientists who placed inordinate faith in nuclear power," he says. And nuclear power according to Righter was merely "another version of the myth of energy superabundance," a source too cheap to meter. Today's "dash to gas" may be repeating the same mistakes as those of the nuclear era. Righter sounds a warning about the future of wind energy in the United States. "Whether it will prosper depends on politics, policies, and pricing." And the current "restructuring" mania sweeping the electric utility industry does not bode well. "Total deregulation would ignore the limits of our finite world as well as the rights of future generations. It would abandon any concept of stewardship, leaving the fate of the world to chance rather than sensible planning. . ." Wind energy, concludes Righter, "has merits that, relative to other sources of power generation, tip the balance in its favor." "Wind Energy in America" is a must read by anyone who wants to understand the development of wind energy in the United States. Robert Righter, "Wind Energy in America: A History," University of Oklahoma Press, 1996, 361 pp, notes, bibliographic note, index, ISBN 0-8061-2812-7, cloth, $34.95. The book contains 41 illustrations, including several previously unpublished photos of early American wind turbines. "Wind Energy in America: A History" can be ordered from the University of Oklahoma Press, 4100 28th Ave, N.W., Norman, OK 73069-8218. Or by calling 1 800 627 7377 in North America, or +1 405 325 5111 outside North America, or faxing +1 405 325 4000. 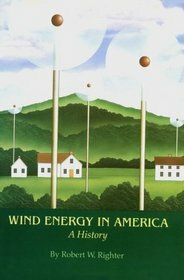 Wind Energy in America: A History can also be found on Amazon.com.